While I'm a hacker of all kinds of electronics things by night, my day job is being a software developer. That mostly means sitting in front of a computer all day, entering code, debugging, etcetera. You probably can imagine my main weapon of choice to tame all that code is my keyboard: I'm usually happily tapping away on it in order to get my programs to do the things they're supposed to do. Ofcourse, the life of most keyboards isn't eternal. (Although I strongly suspect the IBM Model M I use at home is neigh immortal.) So, on a faithful day, I noticed that the shift key of my work keyboard started to fail. This made my email messages seem much more lazy and wreaked havoc in code I wrote, so I needed to get a new keyboard. 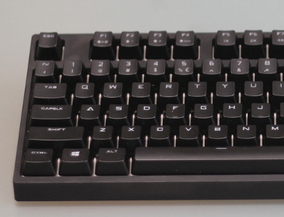 My old keyboard was an okay-ish but otherwise generic rubber dome keyboard, so this would also be a nice opportunity to upgrade to something better, for example a mechanical keyboard. So I went on the Internet and looked for a nice keyboard. I wanted Cherry Brown mechanical switches in it, because I'd probably not make any friends by choosing the loud Cherry Blues. Ten-key-less (without the numpad on the right) would be pretty useful because I don't use that anyway and it'd lessen the distance my hand needs to travel in order to get to the trackball I use. The cheapest keyboard that fulfilled all those requirements was one with a pretty long name: the Coolermaster Quickfire Rapid-I. It's an nice black ten-keyless gaming keyboard without too much hassle: the only actual 'gaming' features it has are N-key rollover (meaning no keyboard ghosting), increasing the key repetition rate to stupendous levels (a sort of 'turbo feature' for your keyboard, if you will) and LED backlighting involving a white LED behind each single key. The LED backlighting actually is an interesting feature, and the keyboard uses it to make available a bunch of lighting modes: you can either set a fixed pattern of LEDs that are lit, or you can set modes that react to you typing, for example lighting up every key you type and then slowly fading it out. So the keyboard arrived and I brought it to work. The next day, I showed it off to my colleagues. They all know I have a penchant for voiding the warranty of my toys, so one jokingly told me: "You have had this keyboard for all of 24 hours now. The thing has a bunch of LEDs and some arrow keys. I'm disappointed that you haven't got Snake running on it yet."